Sri Lanka has a very long history of wetland management, with records of the construction of ‘tanks’ (reservoirs) of varying size from as early as 300 B.C. in the drier part of the country principally to provide water for irrigation. These tanks slowly evolved to become connected into complex systems that ‘cascaded’ and allowed water from one tank to flow to the next further downstream, and these systems are still in existence today. As a result, there has always been a high level of awareness of the importance of wetlands in Sri Lanka. However, due to the 26 year civil war from 1983, it was difficult to carry out field wetland conservation activities but after the conflict ended in 2009, it was possible to conduct ecological surveys again and especially in those areas that had been affected by the war. Over the past four years, the Sri Lank government has been active in designating three wetlands as Ramsar Sites and more are being planned. World Wetland Day (WWD) activities have also been organized annually, and the business sector are being encouraged to become more involved in wetland conservation. Two government agencies have responsibilities for wetland conservation. One is the Department of Wildlife Conservation (DWC) which is the Ramsar Administrative Authority in the country and the other agency, is the Central Environmental Authority (CEA) who chairs the National Wetland Steering Committee and who was responsible for drafting the National Wetland Policy and Strategy in 2006. For the past few years, both the DWC and the CEA have jointly organized the WWD activities. The event in 2013 was no exception, being attended by both the Hon. 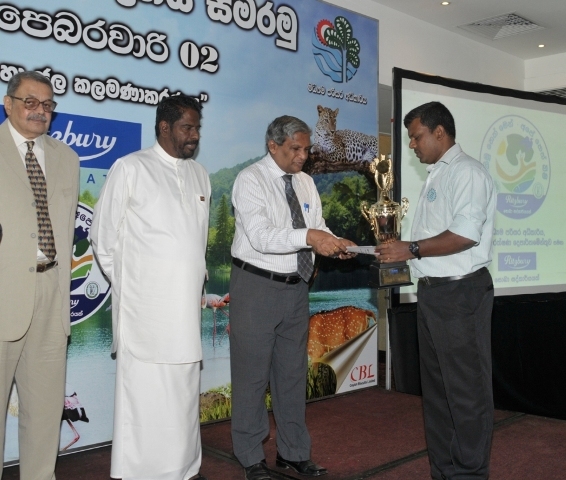 Vijith Vijithamuni Zoysa (Minister of Wildlife Resources Conservation) and the Hon. 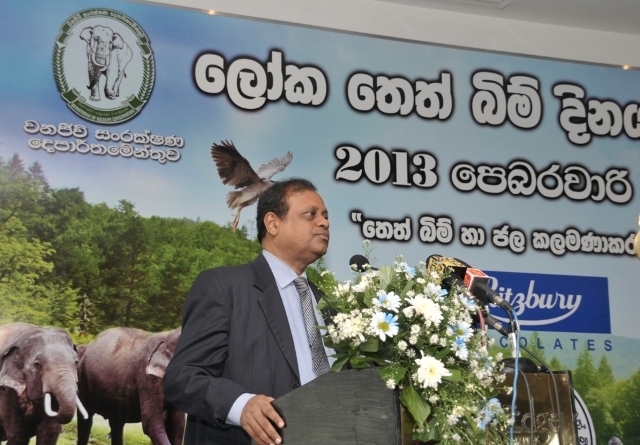 Susil Premajayantha (Minister of Environment and Renewable Energies). A WWD student poster competition was organized and the award ceremony was held during the WWD event. This was also used to celebrate the designation of Sri Lanka’s sixth, and newest Ramsar Site, the Wilpattu Ramsar Site. The WWD event this year (and the poster competition) was sponsored by Ritzbury Chocolates, as they did in 2012. 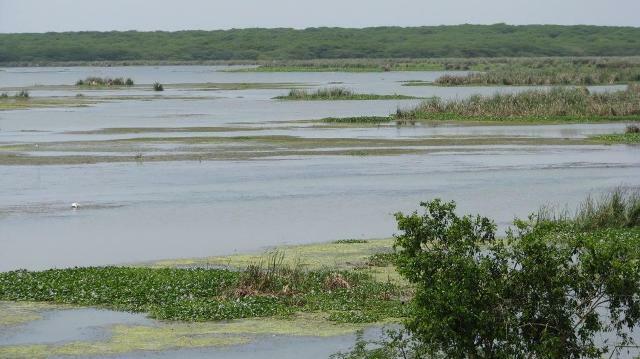 As part of the WWD celebrations, a new ‘Wetland Laboratory’ was opened at the Bundala Ramsar Site, the first of Sri Lanka’s six Ramsar Sites which was designated in 1990. The new laboratory was sponsored by UNESCO and the Government of Sri Lanka, and was opened by Mr. H.D. 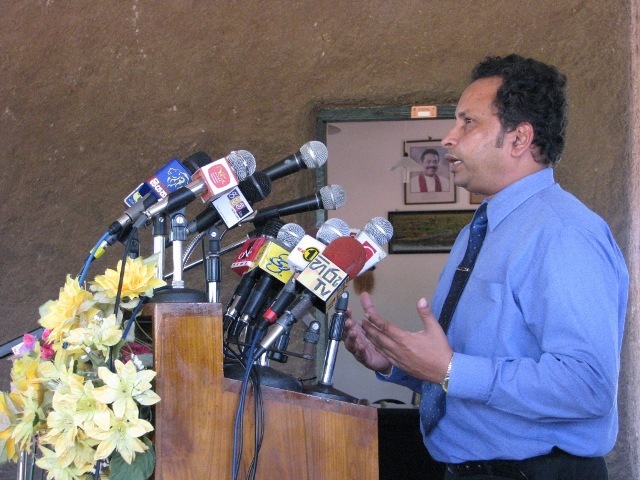 Ratnayake (Director General – Wildlife). Apart from providing laboratory space for water quality monitoring, the laboratory will also be used by students from the National Wildlife training and research centre of Sri Lanka. 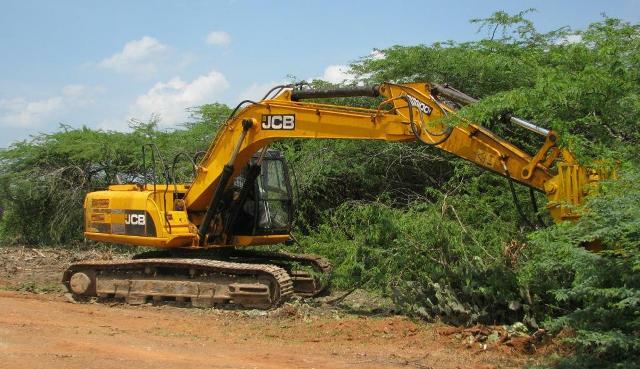 The celebrations at Bundala also included the launch of a project by United Dendro Energy (Pvt) Ltd. to remove the two exotic shrub Prosopis juliflora and the exotic cactus Opuntia dillenii that had invaded significant parts of the Ramsar Sites. The removed plant biomass would then be used for energy production. Previously, the Ramsar Site had also received support from other sources to remove these exotic species, such as MAS Linea Aqua (Pvt) Ltd together with Hatton National bank, Odel online fashion store, Jana Aruna Foundation with IUCN. Dilmah Conservation is another organization that is supporting wetland conservation in Sri Lanka and was started by the family that founded Dilmah Tea. Currently, Dilmah Conservation is involved with the mapping of the important Kayankerni Reef as a marine sanctuary, as well as preparing to have the core area used by dugongs in Sri Lanka declared as a sanctuary. Dilmah Conservation also organizes public lectures and the Senior Regional Advisor for Asia-Oceania was invited to give one such lecture on wetland conservation during the period of the WWD celebrations. Although wetland conservation in Sri Lanka faces many challenges – as in many other countries – the advantage that Sri Lanka has is the broad support and enthusiasm for environmental conservation amongst the many government agencies, private sector and members of the public. This was very encouraging and the country deserves to be an example for others. Report by Lew Young, Senior Regional Advisor for Asia-Oceania. Photos by Lew Young and Mr. Rohitha Gunawardane.